THE END OF THE TOUR is a deceptively simple movie. It chronicles the five days that Rolling Stone journalist David Lipsky spent interviewing the famous writer David Foster Wallace at the end of Wallace's book tour for his novel, Infinite Jest. I was a bit nervous walking into the screening because I haven't read any of Wallace's work, and only vaguely new the story of his depression and eventual suicide. Also, I was a bit nervous that the two Davids were being played by Jason Segel and Jesse Eisenberg respectively. Not that I don't think they're good actors. It's just that they tend to play the same sort of characters all the time. Siegel in particular tends to go for those big loveable man-child comedy characters and I was wondering if he could play a quieter, more intellectual, more complex character and actually disappear into the role. Well, my fears were utterly overturned by what is a subtle, quiet, nuanced performance that truly shows Segel's range. This is his film. As the movie opens we meet Jesse Eisenberg's character - a smart journalist who's just had a book published to not much acclaim. He lobbies for the interview with Wallace having read his book and travels to meet him in a snow-bound small town. Wallace comes across as friendly and easy to talk to and charming and bright. He seems very concerned with how the interview will depict him, and concerned to come across as authentic. He's evidently trying to live a certain kind of life and is struggling with the idea that he both wants success and validation but doesn't want to become a parody of the kind of celebrity-hungry star that fills modern culture. He uses the word "American" a lot to describe a kind of modern image-obsessed culture that can be addictive - that is addictive to him. He argues that the addiction to popular culture - an addiction that seduces us into thinking we can have more fun alone with our devices and TV sets - is making us lesser people and more lonely. He argues that he used alcohol to medicate this ennui, but not hard drugs. That his addiction and depression was not glamourous. He does all these things, but in a far more articulate way than I have just described. It's as if Jason Segel's David Foster Wallace is describing every fear and insecurity and concern about the thinness of modern life you ever had but in a gentler, kinder, more accurate and elegant way than you could have come up. I just wanted to spend more time with him, and maybe the answer is to read his books, or at least the book upon which this film is based. Which is not to say that the film white-washes Wallace's character. We get his almost embarrassed desire to get laid off of his success and the weird possessiveness he exerts over his female fans. When he perceives David Lipsky is flirting with one of them, he phone-flirts with Lipsky's girlfriend in retaliation. He wants to set the boundaries - who Lipsky can talk with and flirt with. But there's a sense throughout it all that he Wallace is trying to be as honest as he can, and even to be kind to Lipsky - warning him of the dangers of success and how depression prevents him from trusting it. I have no idea if this movie is authentically portraying the real Wallace, as if such a thing is even possible. Although there is some irony that a man apparently so concerned with other's interpreting his personality in articles is now interpreted on screen. But I think you can enjoy this film just as an exploration of what it means to be bright and sincere and depressed in modern celebrity culture. You can also just sit back and enjoy a tremendous performance by Segel. He's the coolest friend you never had, except that for like the writer David Lipsky, for five days you can imagine it really was so. 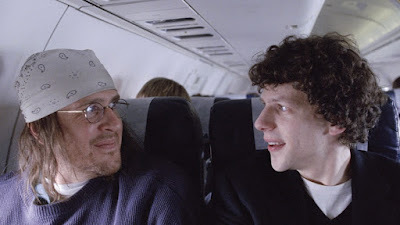 THE END OF THE TOUR has a running time of 106 minutes and is rated R. The movie played Sundance and went on release in the USA ad Canada this summer. It goes on release in Brazil and Greece on November 12th, and in the Netherlands on January 14th.